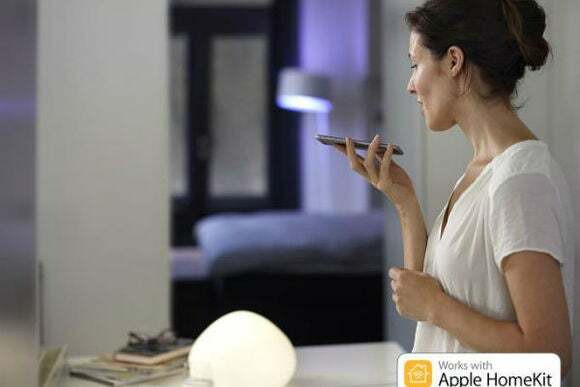 Existing Hue users can add Siri voice controls to their smart bulb setups for an extra $40. HomeKit support has arrived for Philips Hue bulbs, letting users control their lighting through Apple’s Siri voice assistant. With HomeKit, users can adjust the lighting through voice commands on an iPhone, iPad, or Apple Watch. Users can also set more complicated “scenes,” such as one that turns off all the lights and turns down the thermostat for the night. To get these HomeKit features, users will need a new Philips Hue Bridge hub that meets Apple’s hardware requirements. This hub acts as the link between the bulbs (which talk to the hub using the ZigBee protocol) and other devices on the local Wi-Fi network. Existing Hue users won’t have to replace any of their bulbs, and can get the new hub at a discounted price of $40 between November 1 and December 31, while new users can get it for $60. The new hub will also be included in Hue Starter Kits from now on. Why this matters: Hue is one of the most recognizable smart home products, and has long been a partner to Apple with its bulbs selling through the Apple Store. While the first wave of HomeKit devices only launched a few months ago, Hue’s support already feels long overdue. HomeKit support isn’t the only noteworthy change in the new Hue Bridge. According to Ars Technica, Philips is also adding support for other smart home frameworks, which could allow Hue to communicate directly with other products, independently of a local Wi-Fi network. For instance, Philips is working on supporting Google’s Weave framework, which is being used by Nest thermostats, smoke detectors, and security cameras. Allowing these devices to speak directly with one another would be more secure with lower latency, and could allow Hue bulbs and other products to reach where Wi-Fi might not. It also help avoid outages if the Wi-Fi router goes down. In addition to the new hub, Philips is slashing the price of its Hue Luxe bulbs, which will now be known as Hue White, The Verge reports. They’ll now cost $15 apiece instead of $30. (Standard Hue bulbs, which support 16 million colors, cost $60.) Philips is also selling a new light strip that’s designed to be more of a primary lighting solution. The basic strip measures 2 meters and sells for $90, and users can attach up to eight more 1-meter strips for $30 each.